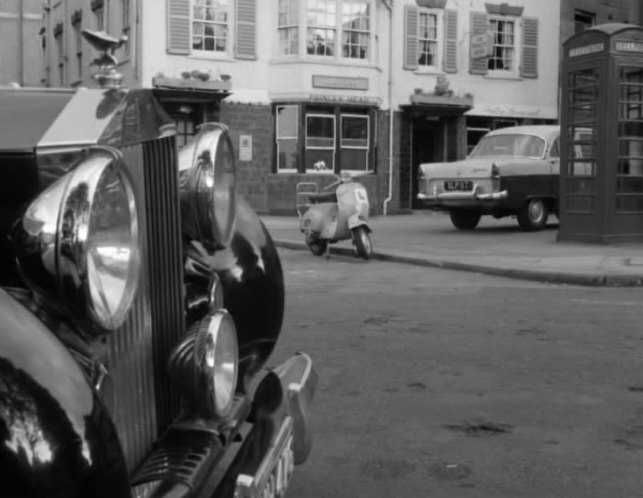 IMCDb.org: 1946 Rolls-Royce Silver Wraith in "Adam Adamant Lives!, 1966-1967"
The design of the front number plate housing suggests Silver Dawn or Silver Wraith, but very few Dawns had P100 lights as most stuck to the Standard Steel Saloon front wings, even on coachbuilt cars. My money would go on the Wraith, but you just cannot see enough of the car to call the chassis, or the coachbuilder. The picture of the Zephyr gives a very slightly different angle, showing the standard air intake grilles (one is a dummy) inboard and below the headlights. The numberplate appears to be of the ABC 123 sort, which would fit those models. I think the plate ends in 475 or maybe 476. Can't see anything in our Silver Dawn/Wraith/Silver Wraith with a matching plate. Dawn, Standard Steel Saloon with P100 lights. I think I have misled you, sorry. The reference above meant that it was possible to have a Dawn with the Standard Steel body but separate lights, not that this was one. It might still be a Silver Wraith, less likely a prewar Wraith, though, with those air duct grilles. There isn't a 1938 Wraith Standard Steel Saloon. All of the Wraiths were built on an 11 foot 4 inch wheelbase chassis prewar and cannot, therefore, have been fitted with the Standard Steel Saloon body which was not introduced until 1946 and was designed for the 10 foot wheelbase Mk VI Bentley or Silver Dawn. The Silver Wraiths can't be so fitted either, because the chassis of those cars is too long at 10 feet seven inches or 11 feet one inch wheelbase. For my education, please could you tell me how it was worked out that this was a 1938 Wraith? Best fit from your comments. What do you suggest instead? I think it is post war, but as I said nearly at the top, you just cannot see enough to be able to give a certain identification. On quantity built, and allowing for two things, firstly the minute number of Silver Dawns with those big headlights, and secondly the definitely post war intake grilles, as found on many post war cars before the Silver Cloud type, I'd go for it being a Silver Wraith. I do, however wish to remind you of my original caveat. johnfromstaffs wrote .... my original caveat. That's fine. You've taken it as far as it can go on what's available, and there's unlikely to be further progress without additional input of some sort.